Blog post What can marshmallows teach us about self-control? The ability to delay gratification, being able to focus on the important things and plan for the future, rather than just taking the easy, immediate reward, has been linked to success in life. But do people have an innate sense of self-control? And how do we test it? As it turns out, with marshmallows. 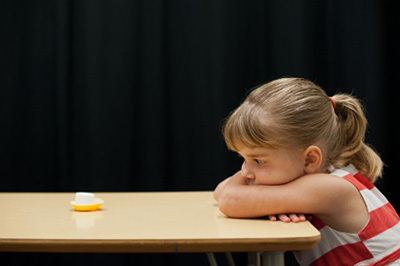 In the 1960s Walter Michel, then a psychology professor at Stanford university, devised an experiment to test the ability to delay gratification in children. Several kids, between the ages of 4 and 6, were put in a room with one marshmallow on the table (or another snack the child liked, like a cookie). The child was told that he could eat the treat if he wanted to but if he was able to wait for the researcher to come back in 15 minutes without eating it he would be given a second treat. A few of the kids ate the marshmallow as soon as the researcher left the room. About a third were able to wait for the whole 15 minutes and received a second treat as a reward. But the most interesting aspect of all of this is how this measurement reflected the children’s success later on. Michel followed up on the children several years later, when they were adults. The children with the least self-control were, later in life, more likely to have worse social skills and unhealthy BMI. They would also be more likely to abuse harmful substances, do worse on standardised tests and be less able to “to cope with frustration and stress in adolescence” (Shoda, 1990). So it seems that self-control, the ability to delay gratification, has quite a big influence on people’s lives, just how the level of self-discipline of students is much better than IQ tests at predicting the future academic achievement of students (Duckworth, 2005). But is this ability innate or can it be learned? Is it just winning the genetic lottery? A very recent study by Celeste Kidd et al. of Rochester University, published in 2012 by the journal Cognition, suggests that children’s self-control is not just a hereditary ability but is also influenced by the environment. The researchers wanted to find out which factors influence the child’s decision to eat the marshmallow early. So they recreated the classic Stanford experiment. They randomly assigned 28 children, aged 3 to 5, to two groups. The first group was put in a “non-reliable” environment, while the second was put in a “reliable” environment. However, before giving the child the sweet marshmallow dilemma, each kid was tasked with decorating a piece of paper. The first group was given a box of used crayons, then told by the researcher that if they were able to wait for him, he would come back with a box of new crayons. However, the researcher then came back empty-handed and told the child that they were mistaken, there were no other art supplies after all. Afterwards, the researcher placed a small sticker on the table for the child to use. The child was then told that if they were able to wait for the researcher to come back, they would be given more and better stickers. Once again, the researcher came back without extra art supplies. The second group were made the same promises as the first group, but in their case the researchers came back with what they had promised. After this part of the experiment the children were given the marshmallow test. A single marshmallow was placed in front of them and they were told that if they could wait 15 minutes, they would get an extra one as a a prize. As recounted by Celeste Kidd and Holly Palmeri, two writers of the study, the children’s reaction was often pretty funny. Some pretended to be asleep, some started singing and dancing and some nibbled at the bottom of the marshmallow and placed it back on the plate, hiding the evidence. One kid picked up the marshmallow as soon as the researcher left. But he didn’t eat it. He instead sat on it, hiding it from view. But how differently did the two groups perform? Very differently. All but one of the children in the first group did not manage to wait the full 15 minutes. Of the second group 9 out of 14 managed to wait. On average, children in the first group waited 3 minutes and 2 seconds before eating the marshmallow. Children in the second group waited, on average, 12 minutes and 2 seconds. The children in the original Stanford studies waited approximately 6 minutes on average. Hence, a reliable environment doubles the wait time, while a non-reliable one halves it. Even though the number of children in the study was small, the results are very statistically significant (p < 0.0005). It does make sense though. The decision to delay gratification is influenced by how strongly the child believes that he will get the second treat. The rational choice, in such an environment, is to not delay gratification. Children with more reliable (and possibly ‘better’) parents are likely better at self-control than those with unreliable parents. -Richard Aslin, the William R. Kenan Professor of brain and cognitive sciences of Rochester University as quoted here. *All the children were given 3 marshmallows in the end.